When the first yellow flag of the race unfurled, team owner Michael Andretti had to have been feeling good. It was on lap 53, just beyond quarter distance in this year’s Indianapolis 500. Andretti had a record six entries in the contest and five of them were running in the top ten. It had been a pretty decent month. Their cars hadn’t been the outright fastest but they had been very competitive. It seemed the Honda teams were enjoying a slight horsepower advantage so they had that going for them. The big question was reliability- Would they go the distance? Many Honda power plants had already failed during practice. Defending 500 Champion Alexander Rossi led the team in qualifying, placing his NAPA Auto Parts sponsored mount on the outside of row one. In row two were veteran Takuma Sato (traded this season for Carlos Munoz from A.J. Foyt Ent.) and rookie Fernando Alonso. Alonso had stolen all the press this month. He was a two time Formula One Champion who had skipped Monte Carlo to participate in this year’s 500. Sitting smack dab in the middle of row three was Michael’s son, Marco. Not a winner but always a contender at the Brickyard. Behind him in the tenth slot was 2014 winner and unofficial team leader Ryan Hunter-Reay. And finally back in the twenty seventh starting spot, another rookie Jack Harvey. At the drop of the green flag Chip Ganassi’s drivers took the point. Pole sitter Scott Dixon led the first five laps before turning it over to crowd favorite Tony Kanaan. Rossi and Sato held their own while Alonso took a step back to find his rhythm and Marco advanced. 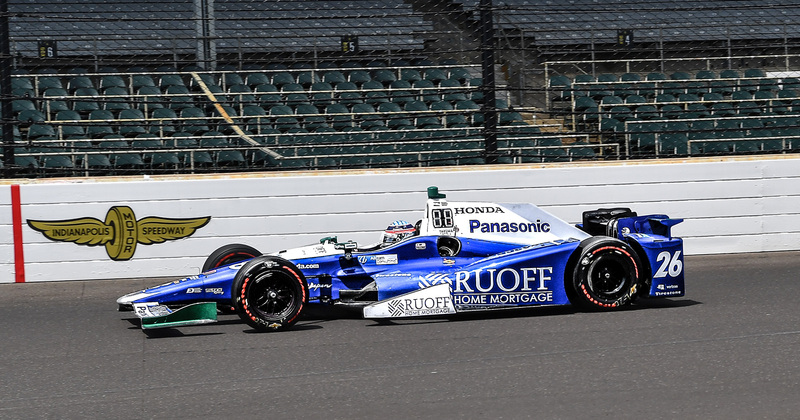 Kanaan led for twenty two circuits then passed the baton to hometown hero Ed Carpenter. Carpenter and teammate J.R. Hildebrand led through lap thirty four when Rossi decided to make his move. Alonso (having found his mojo) followed Rossi to the point and the duo proceeded to swap positions until the aforementioned first yellow flag occurred. This yellow was for a n incident involving sophomore driver Jay Howard and Dixon. It was switched to a red flag when the seriousness of this accident was realized though both drivers walked away. When the race was stopped Alonso was the leader, Rossi was second, Sato was now third, Carpenter was fourth in his Chevrolet and Hunter-Reay had advanced to fifth. Marco Andretti was still in the top ten and Harvey was nowhere on the horizon. When racing resumed the Andretti boys continued their fun and games up front. Sato had just taken the lead for the first time when Foyt driver Conor Daly hit the wall and Harvey ran over the debris. Both cars were eliminated. Sato led the restart but succumbed to Rossi on lap seventy six. Hunter-Reay forged into the lead for the first time three laps later. Andretti Autosports dominated the middle portion of the race. 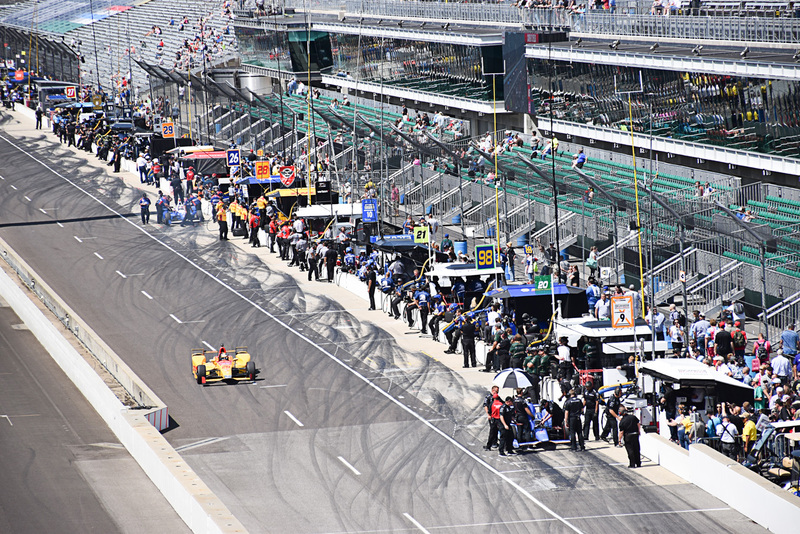 The lead was traded back and forth between Rossi, Alonso and Hunter-Reay. At one point (with Sato) the team occupied positions one through four! Then as it has happened so many times in past, the entire complexion of the race began to change. After leading on seven separate occasions for a total of twenty eight laps, Hunter-Reay blew his engine. Thirty laps later another front runner Charlie Kimball popped the motor in his Ganassi Honda. Was it a trend? And then here came Alonso, smoke pouring from the back of his papaya colored Honda. He ground to a halt on the front straightaway just past the pit lane and climbed from his car to a tremendous ovation. Meanwhile an underrated second year driver named Max Chilton had taken over the race. Chilton piloting yet another Ganassi Honda would lead the most laps of the day. But clawing his way to the front was three time winner Helio Castroneves. Carrying the banner for Roger Penske and Chevrolet, Castroneves was on mission- to join Foyt, Al Unser and Rick Mears as the only four time Indy winners. In the closing laps things had gone to hell for Andretti. 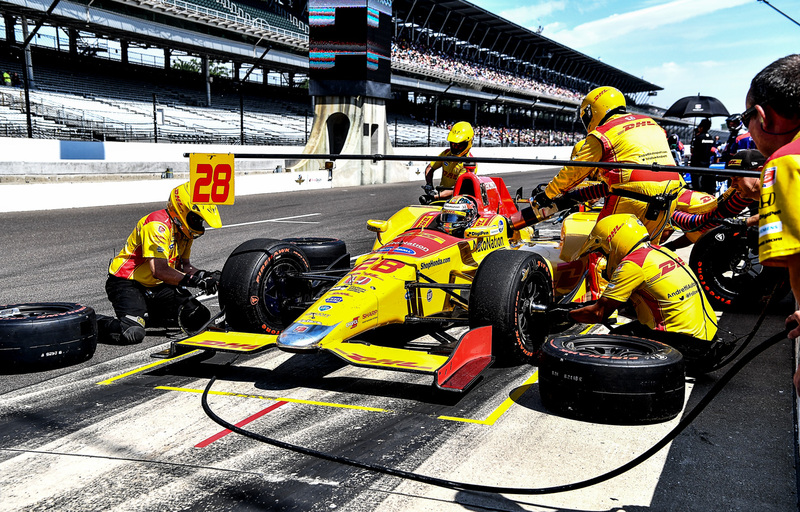 Hunter-Reay and Alonso were sidelined. A refueling issue had negated Rossi’s earlier efforts and a lost winglet had ruined Marco’s chance of a high finish. 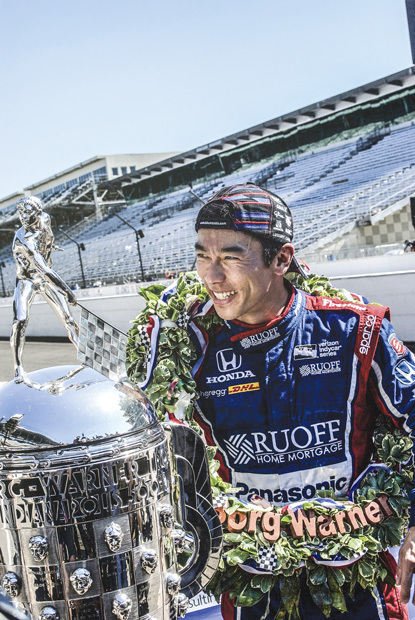 Only Sato remained within striking distance—it was all on him. Sato you may remember had been in this position before. In 2012 he attempted a last lap pass on Dario Franchitti and spun into the wall. If he regretted it, he never said so nor did he apologize. “No Attack—No Chance” is his motto (and it likely helped him secure a three year stint with A. J. Foyt). With seven laps remaining Chilton was doing a yeoman’s job but Castroneves wanted it more. He battled past the remarkable rookie Ed Jones and seized the lead from Chilton. Now it was Sato’s time. Would his Honda hold together? There was no way to know. He pointed his Dallara toward the outside groove and kept his foot buried in it. Around Castroneves he went and he kept on going, actually opening a gap at the finish. In April, I talked briefly about the World of Speed and their recent display change. 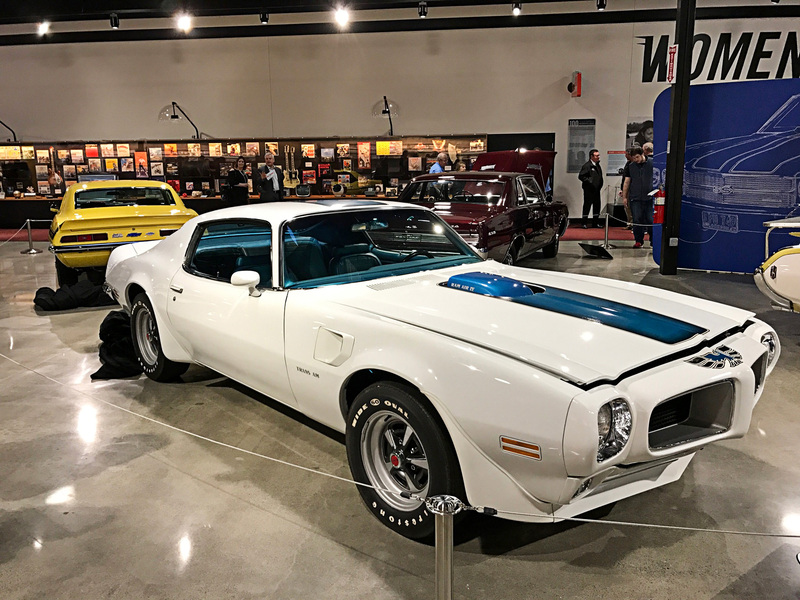 Here is a reminder that they replaced the Indy car display with one of our (my) favorites… Muscle cars! These are cars I grew up with at least from a distance, I could never afford them when they first came out and I for sure can’t afford them now. However, I like to look at them and the WOS has captured a large number of them for their new-ish Muscle Car Display. Go check them out before they go away. You rarely see cars like these on the streets and they are all beautiful in their own right. 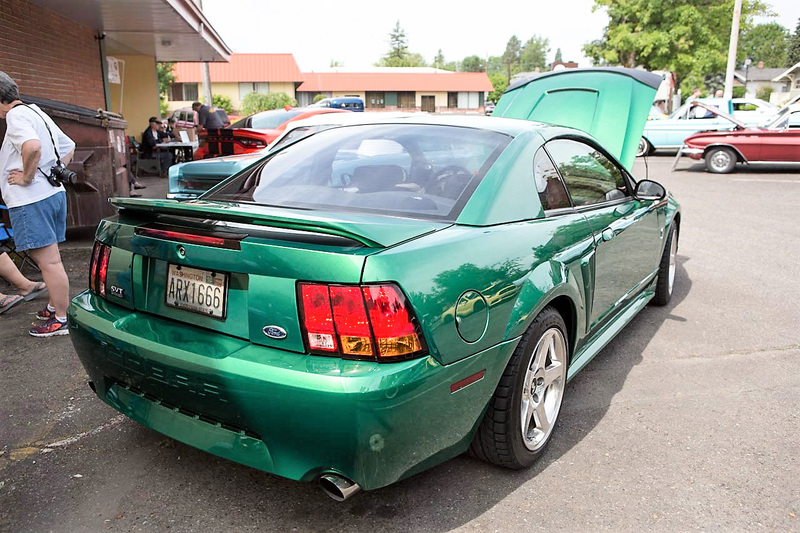 World of Speed, 27490 SW 95th Ave.
April brought Silver Auctions to the greater Portland/Vancouver area. 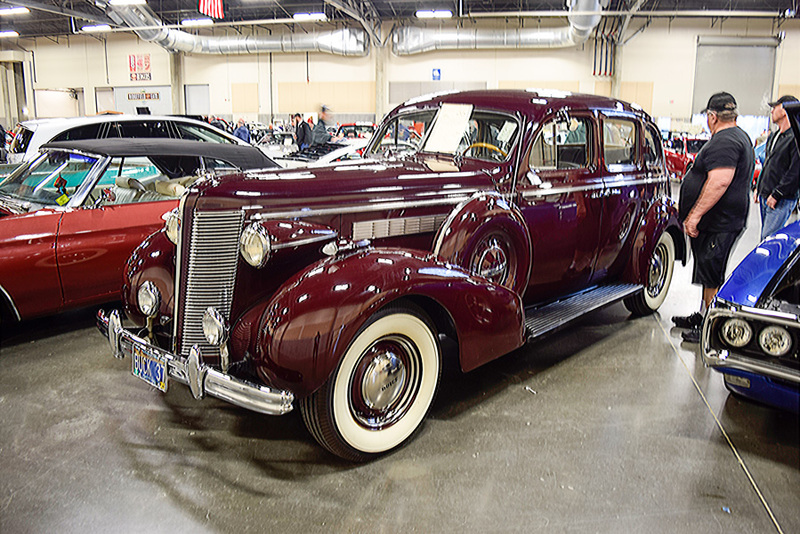 They had about 100 cars on consignment, not all of them “Collector” cars. 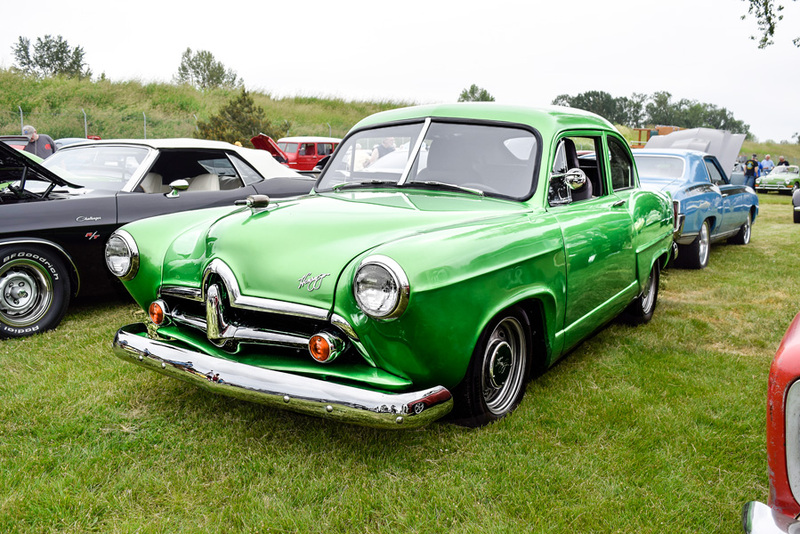 In fact, they had a large number of maybe “future collector cars” that are in fact very current cars. 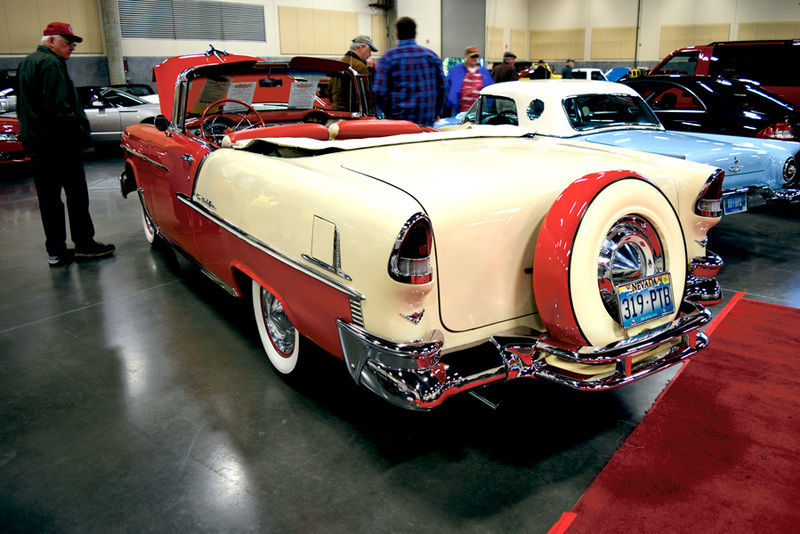 One particularly nice older restoration of a 1955 Chevy Convertible, a few “baby” Birds, a beautiful 66 Nova resto-mod, just to name a few. 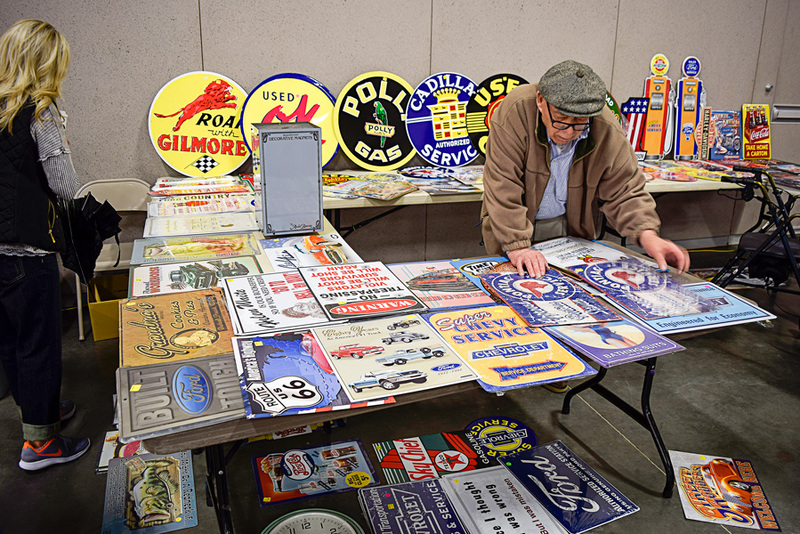 Silver is based in Spokane but they have auctions all over the Northwest as well as Arizona. 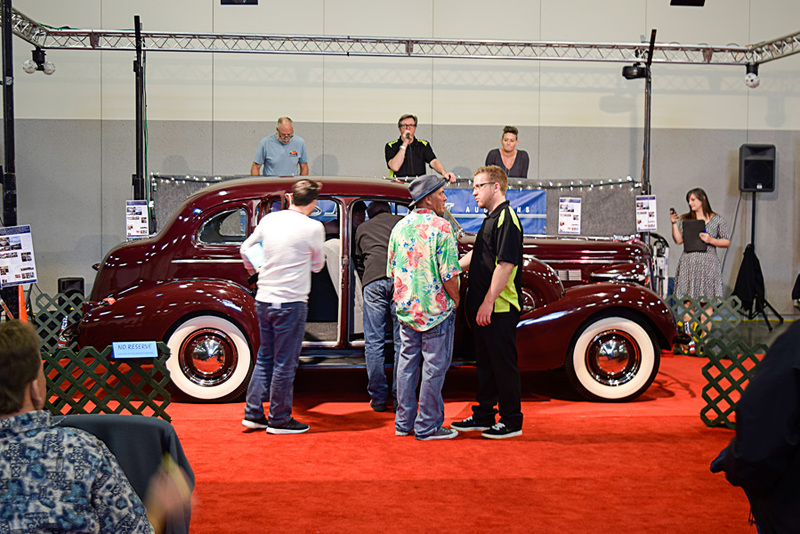 I was at their last auction in Phoenix in January. 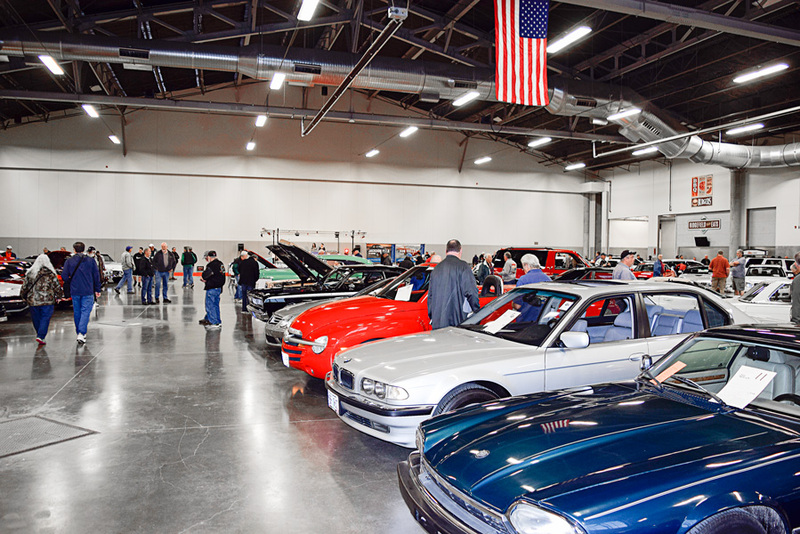 They had a ton of cars Phoenix got a rather unusual winter storm that simply dumped rain on their auction almost non-stop, but then I already reported on that one. Check out their website silverauctions.com for their schedule. 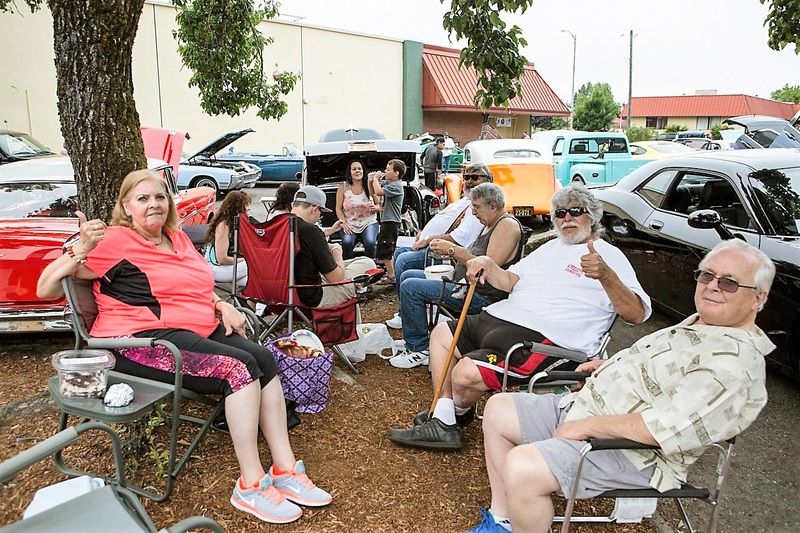 Thanks to the Pharaohs Street Rodders and, their dedicated team of club members, the Endless Summer Cruise-In got underway at 3:30 pm Wednesday June 6th with a parking lot full of Classic Custom Cars, Street Rods and Super Trucks. All proceeds from this fund raising event are dedicated to the Veterans MIAP and the Lines for Life programs, plus a few other local charities. 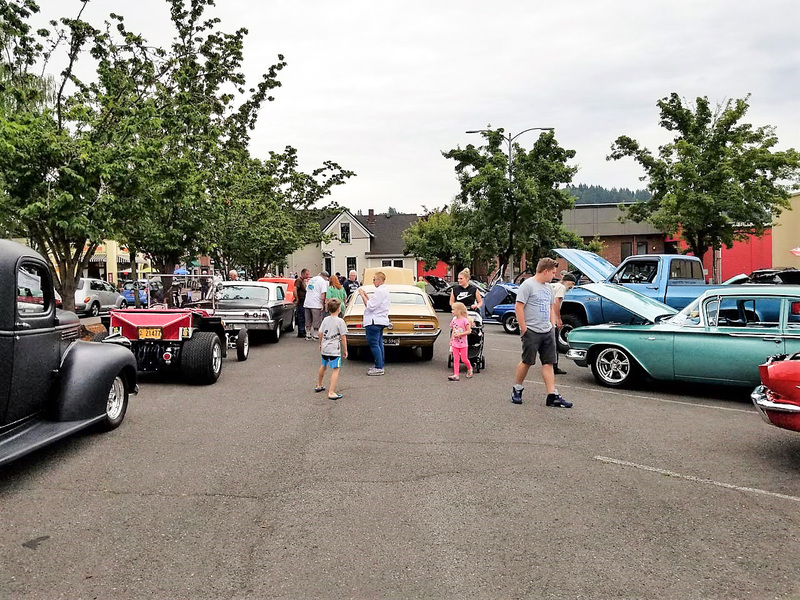 This is a weekly Cruise-In, running every Wednesday (weather permitting) from 3:30 to 7 pm at the East Hills Church Parking lot, on Main Street in beautiful down-town Gresham, Oregon. 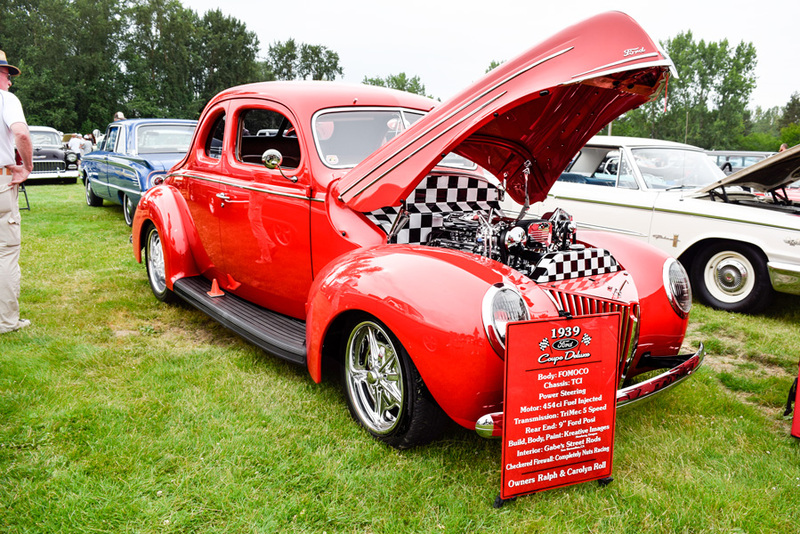 From June to September this fantastic fundraising event has raised tens of thousands of dollars for our Veterans programs, including the Lines for Life and the Missing in America Program plus a special gift is always dedicated to East Hills Youth Programs from the Pharaohs Street Rodders. 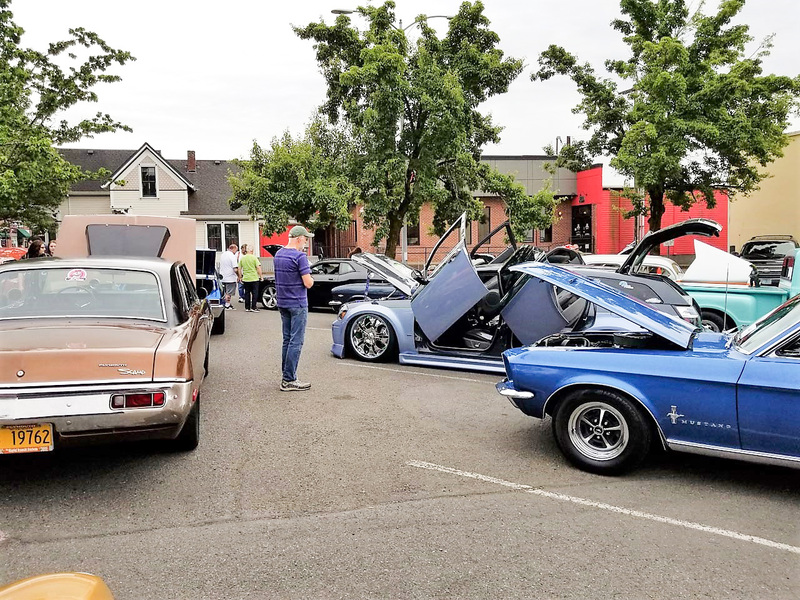 In addition, there is a booth set up representing Doernbecher Children’s Hospital, raising funds for the Children’s Cancer Research program up at OHSU, with a state licensed raffle on a brand-new Ford Mustang. 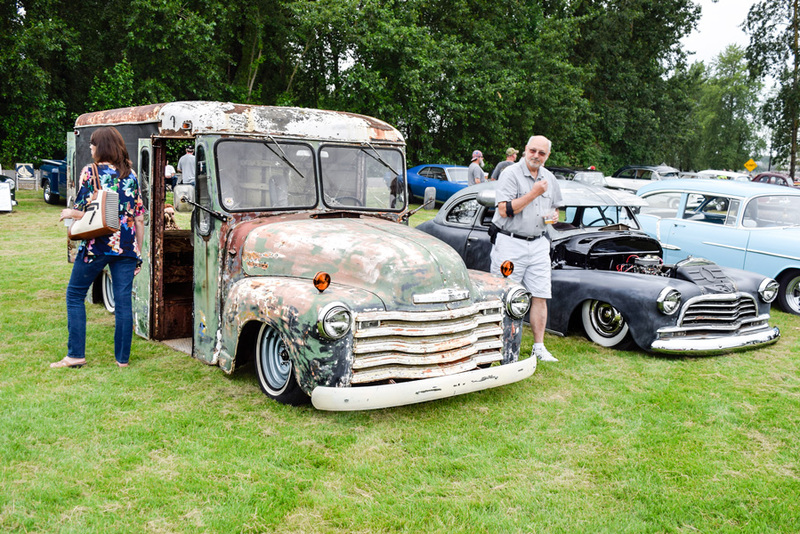 The Endless Summer Cruise-In has a reputation of judging and presenting award winning trophies to just about every car entered at least once throughout the four months that the show is on. A special point of interest, no Pharaohs club member’s vehicles are entered in the judging for a trophy during the regular show time events. Every week about ten trophy plaques and one special Keith Preskey Dedicated Cruiser Award Trophy is presented to just the vehicles entered. 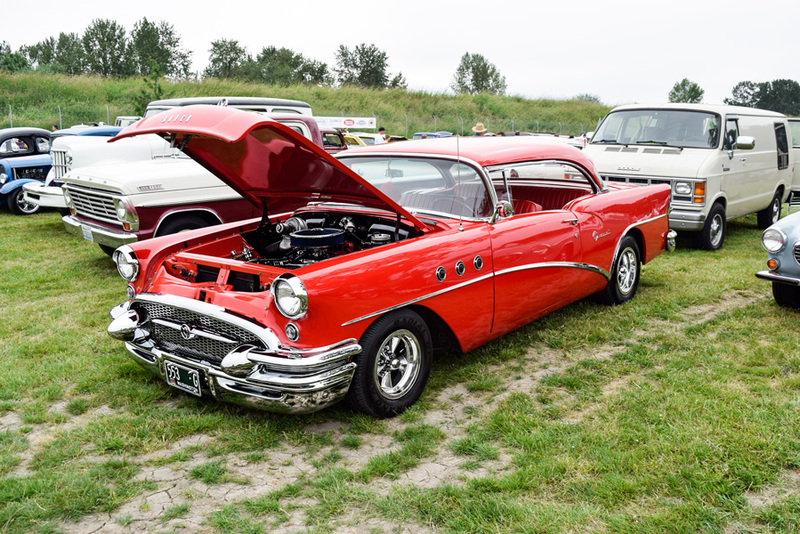 The Endless Summer Cruise-In has become a wonderful family outing not just for the custom and classic car enthusiast, but for the opportunity to witness first-hand how a group of local men and women have grown together with the goal of helping our U.S. Veterans with a dedicated positive program of fund raising for them in their hour of need. Plus the food and drink offerings in down-town Gresham are fantastic. In addition, the ice cream parlors are guaranteed, fun for the whole family. Put this outing on your to do list and I guarantee you won’t be sorry. Stop by the Doernbecher Children’s Hospital KDCCP booth and say hello. The summer time cruises are back! There are a number of recurring events that happen all summer long. 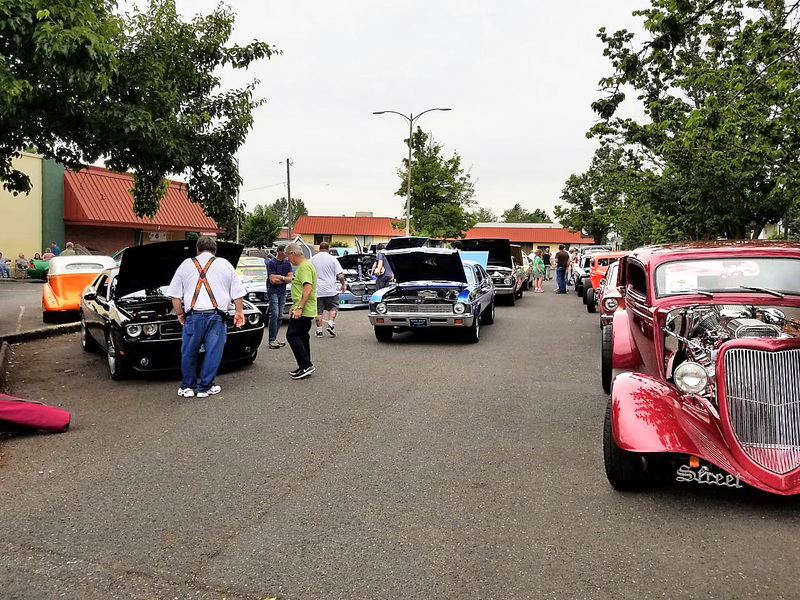 One such weekly cruise is the one at PIR, Beaches Summertime Cruise, celebrating their 22nd year. This cruise goes on every Wednesday starting at 4pm and lasting till dusk. It’s really amazing, this cruise consistently brings in hundreds of participants particularly on opening night which was June 7th this year. The number I heard was 1800 cars. See, I told you it was amazing. At the same time that the cruise is going on there are 1/8 mile drags going on too. 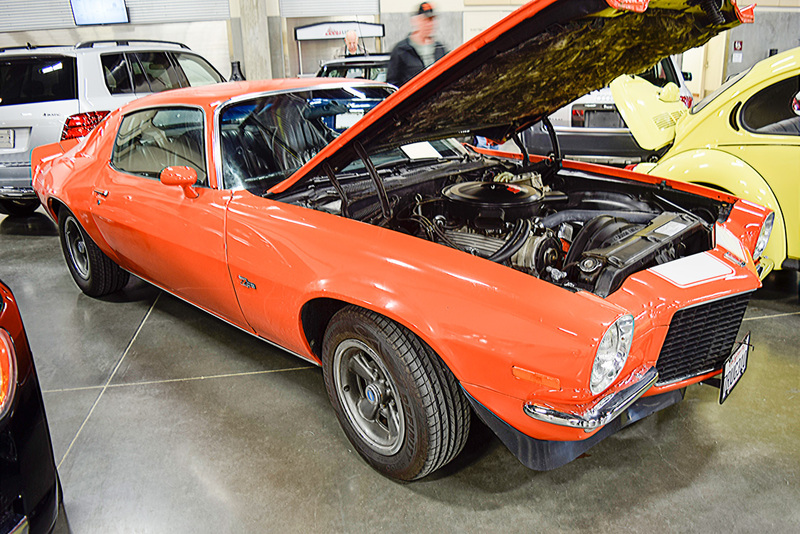 You can go watch the drags and well as “cruise” the cars displayed for one low fee of $5.00 when you drive your pre-73 car. If you don’t bring a car but still want to get in it will cost you a little more but the proceeds, after expenses, are donated to charity. 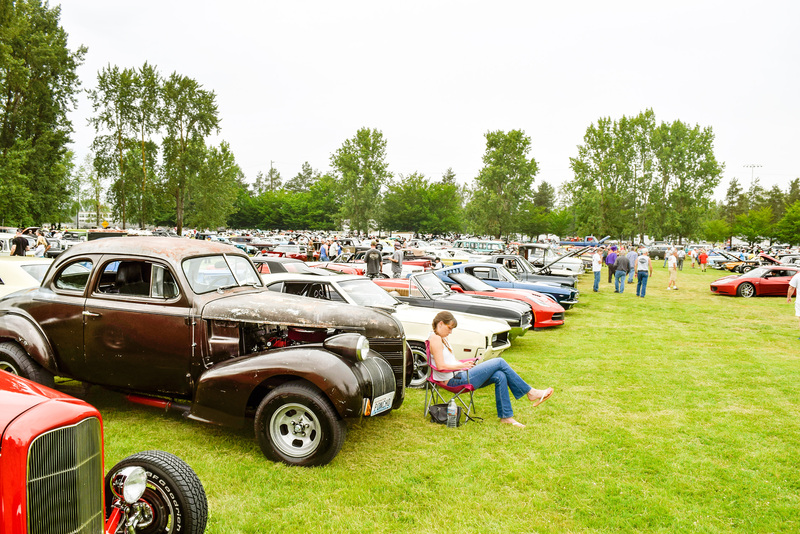 So, plan a Wednesday afternoon/evening and come check out one of the biggest cruises in the Portland Oregon area. Beaches Restaurant is the organizer and they sell food and drink. There are picnic tables in the shade to use and live music from a number of local bands. It’s a party atmosphere but for the whole family with lots to see. You’ll have a good time, I think. Bruce McLaren was born in New Zealand in 1937. Early in adolescence, he was plagued by an unusual illness that affected the growth of his legs. Bedridden for stints of his childhood, Bruce was restless. By age 13 he was enrolled in a technical college and assisted in his father’s racing endeavors. Blazing through Formula 2 in his early twenties, no limp could slow the ‘Flying Kiwi’ down- even if one leg was longer than the other. At age 22 he was the youngest driver to win a top tier Formula1 race in 1959. A short number of years later, McLaren started his own team christened with his namesake, thus creating one of the most successful cross- discipline racing teams of all time. With Bruce at the helm, the team conquered in the Canadian-American Challenge Cup- or CanAm series, while developing a significant Formula1 program. All the while, external pressures tried to lure Bruce’s attention to the Indianapolis Motor Speedway. In the early to mid 60’s, the top drivers from around the world looked at Indy as an ultimate testament to one’s ability and engineers came to play with their newest and best innovations. This was the era of the great ‘Tire Wars’ when Goodyear and Firestone were locked in eternal battle to establish superiority. Seeing Bruce’s talents and innovations, Goodyear urged McLaren toward the Greatest Spectacle. Driver and fellow Kiwi, Denny Hulme added to the whispers, asking Bruce to build him a competitive car. So in 1970- a month before Bruce’s fateful death, the team rolled in three M15 cars for Hulme and Chris Amon to drive. Bruce himself was supposed to pilot a Carroll Shelby turbine, but the builder would pull it from qualifying- citing safety concerns. Early in the month, Hulme’s ride caught fire and he sustained burns on his hands and feet. Amon reportedly came out to see the famed Speedway but was shaken by its speed and magnitude, and thus backed out of his driving obligation. Carl Williams and Peter Revson then filled the M15s. They would finish 9th and 22nd respectively and Team McLaren would win the prestigious Designers Award. While shaking down a CanAm car in Goodwood, England a couple of weeks later Bruce McLaren suddenly crashed and lost his life- but the McLaren team did not die with him. Flying the trademarked ‘Papaya’ Orange, Team McLaren would carry on in all racing fronts- winning USAC and CanAm Championships. In 1974 and again in 1976 Johnny Rutherford drove a McLaren into Victory Lane at Indy. He publicly states that those chassis were some of the best he has ever piloted. Only after Bruce’s death did McLaren’s Formula1 program write themselves into the record books. To date, the program has twelve championships, second only to Ferrari with fifteen. Some of the greatest drivers in history have raced with McLaren including Niki Lauda, James Hunt, Alain Prost, and Aryton Senna. The new era of McLaren Formula1 has seen some problems. Mika Hakkinen was the last to bring home the bacon in 1999 and since, McLaren has fallen from grace. The sport has changed, the engines have evolved and current McLaren pilot and two-time World Champion, Fernando Alonso decided that it was time to make a new statement. On April 12th of this year, Alonso and team announced that they would be withdrawing from Formula1’s biggest race of the year, the Monaco Grand Prix, to race at Indy. Shock, awe and criticism ensued but Alonso stuck with his decision to drive the orange no. 29 McLaren Honda with Andretti Autosport for the month. “We came out here to unite the two worlds of racing” explained Alonso “and I think we did just that…” Fans from around the world made a special trip to see Alonso on racing’s Greatest Stage and Indycar.com reported that over 2 million people tuned in just to see his rookie orientation. The Andretti guys took him under their wings and after a month of being at the top of the practice leaderboard, Alonso was ready to qualify. He lined up 5th for the race and spent the majority of the day up front. After slipping down to 6th at the start, Alonso came roaring into the lead on lap 37. A crowd of 300,000 came to their feet to see the rookie take point. 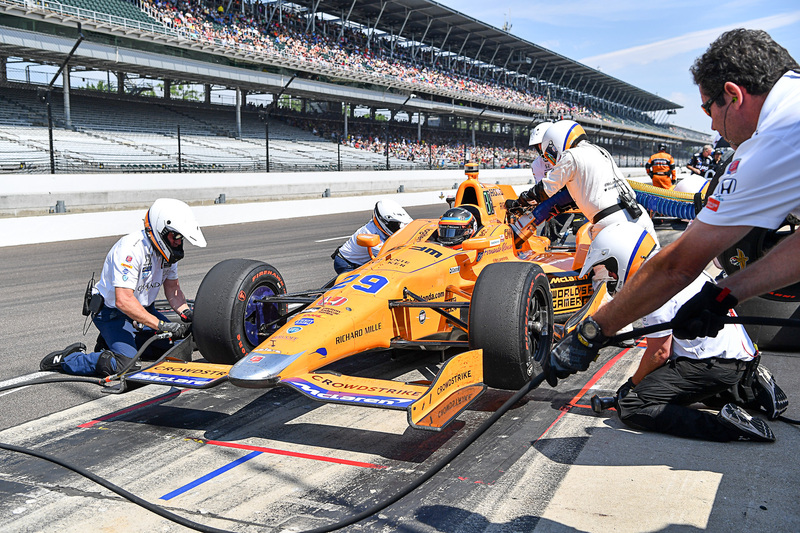 Alonso and the other Andretti drivers would command most of the race—but after a triumphant fight, Alonso coasted to a smoky stop with 20 laps to go. A disappointed crowd applauded him for his heroic efforts, and it was clear that the abrupt end hurt the Spaniard. 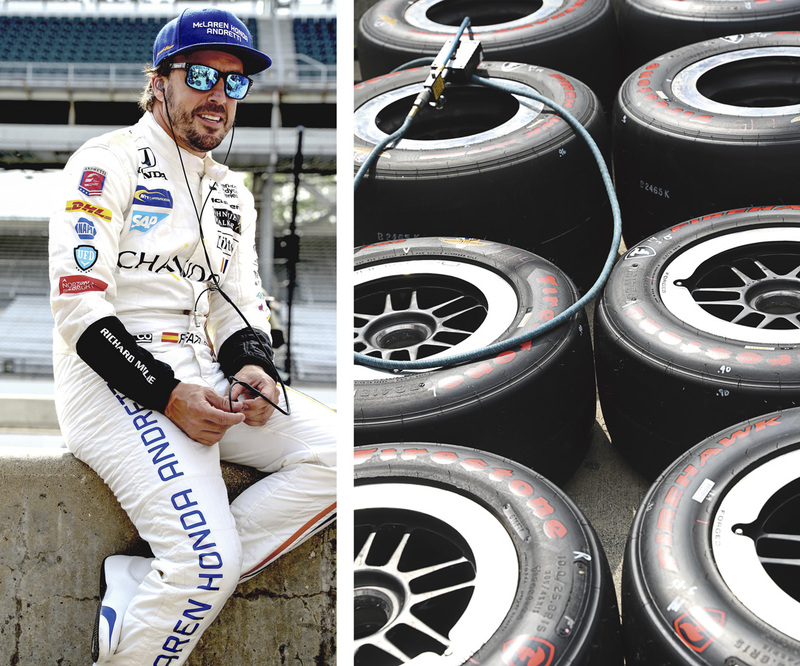 “I can say that I found a new family here”…Alonso said afterward, “I need to tell the F1 guys, you have a good thing going here.” Though he was scored as finishing 24th, Alonso’s efforts rekindle a historical relationship—one uniting Formula1 with Indycar and resurrecting a team’s pedigree at Racing’s Greatest Spectacle. 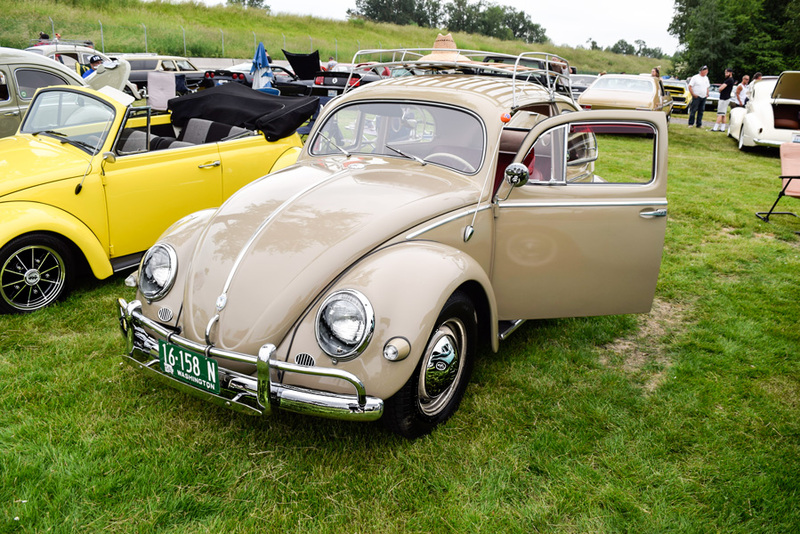 There was once a young man, we’ll call him Pete who grew up late 1950s and 60s, and like many young men of his era, cars were a very large and influential part of his life. 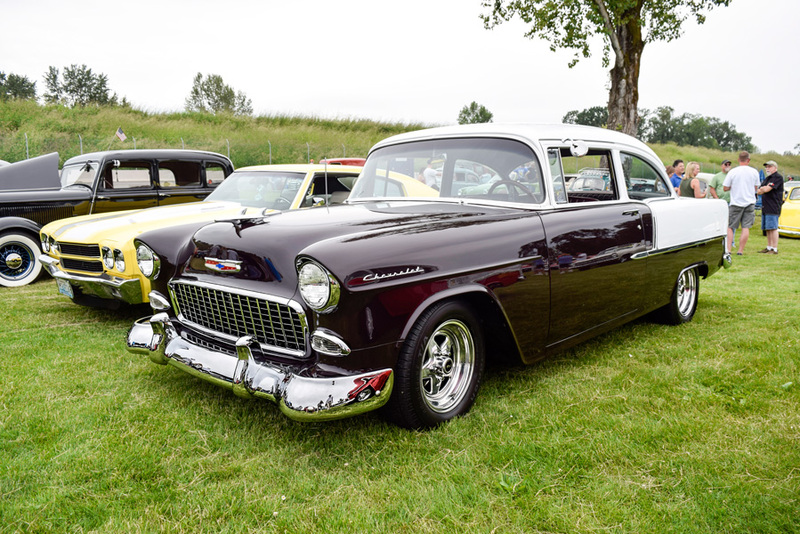 A childhood buddy of Pete’s purchased a 1955 Chevy when he was a junior in high school and the pair spent countless hours together under the hood of the trifive. Looking back now Pete recalls tearing down various components and modifying or rebuilding them, then taking the 55 for test drives to evaluate the results of their efforts. Pete loved the time spent wrenching on the Chevy and he learned a lot, but for him it was more about the camaraderie between friends, and the “under hood talk.” This was the pre-internet era so automotive knowledge was gained by browsing issues of small pages hot rod magazines, and helpful tips from older guys willing to hand out advice. The reward for all their hard work was cruising the local A&W root beer stand on friday nights, and even a little bit of street racing for good measure. Flash forward a few decades into Pete’s retirement years and he finds himself at the perfect phase of his life to build his dream car. 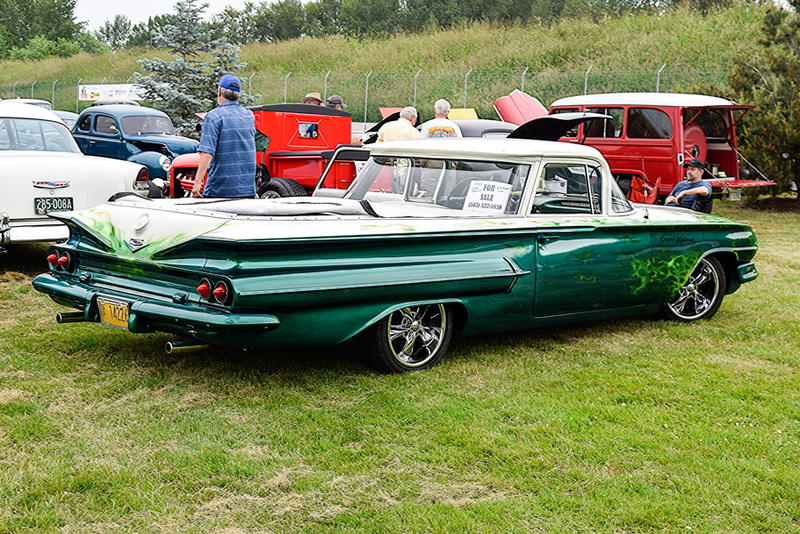 Now there are a lot of cool cars out there, but Pete has the fondest memories of his time around his buddies 55, so he knows that is the car for him. 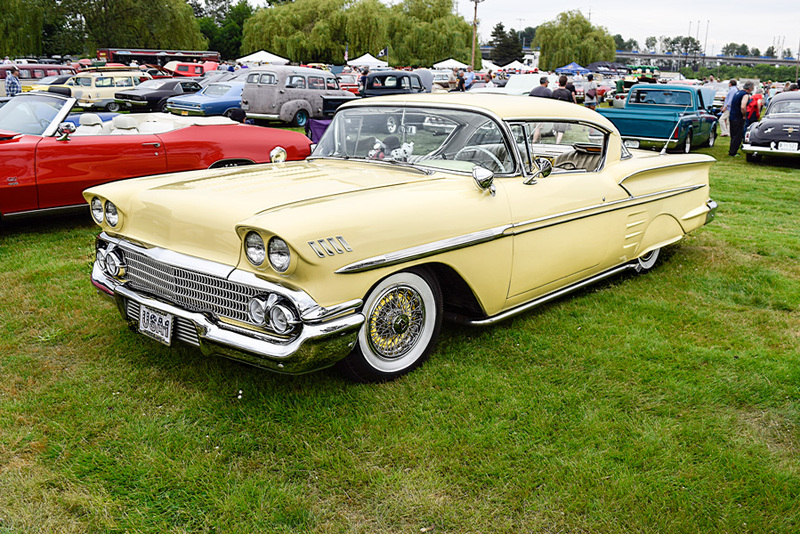 Being conscious of how his old friend that owed the 55 Chevy in high school might feel, Pete contacted his lifelong buddy and asked him what he thought about Pete doing a 55, and his response was “man, go for it! The next big step was locating a shop to turn Pete’s dream into a reality, so Pete began an intense search for the perfect shop. 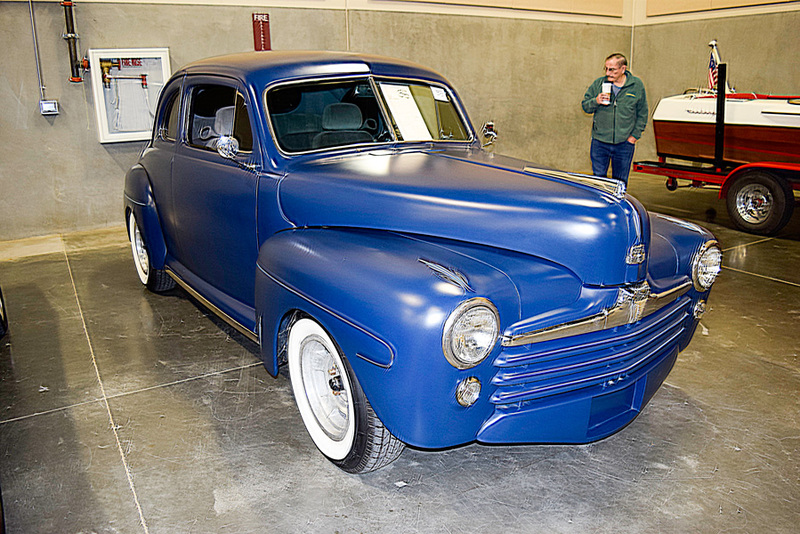 Two variables were key in Pete’s search; a shop that had a strong pedigree for building high end TriFive Chevys as well as a shop that performed the bulk of the build “in house” instead of farming out multiple steps of the build to other specialty shops. Through his searching Pete came across MetalWorks in Eugene, Oregon and could clearly see in the shop’s build galleries that they handle their restorations internally—even the acid dipping process. MetalWorks located 3 potential staring points for the build with various prices. 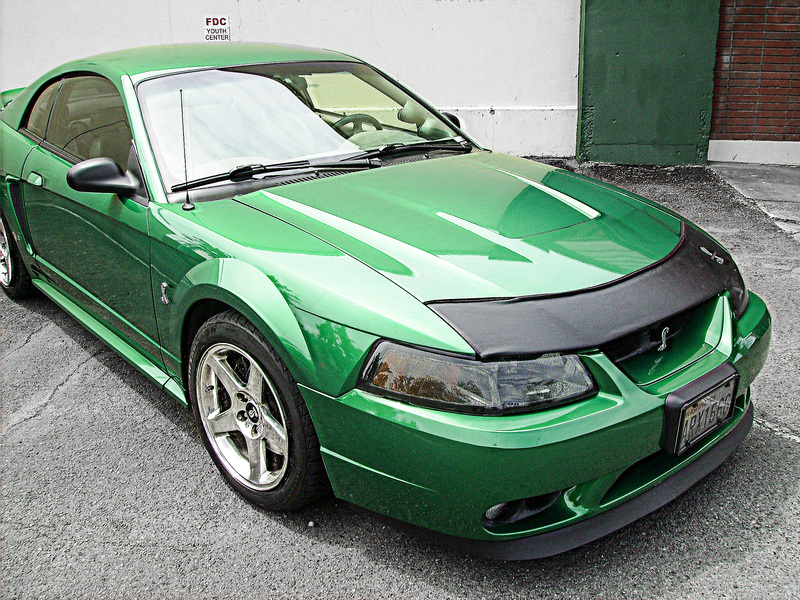 It was stated that there was no point in buying a more expensive car to simply throw away parts that were not going to get used, but to focus on a project car that matched the build. A project was chosen, and the crew at MetalWorks got busy transforming it to Pete’s vision. The 55 chosen for the starting point was a forgotten relic of the Pro-Steet era of the early 1990s. 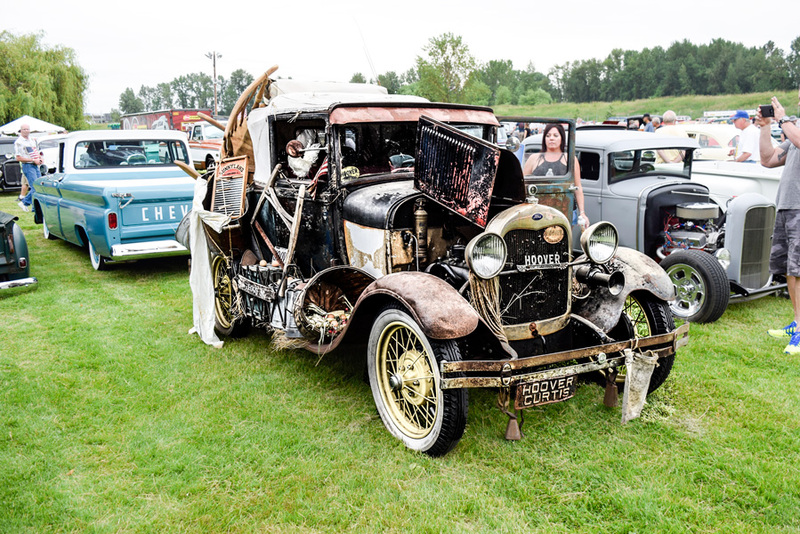 The rolling chassis was sold, and the body sent off for acid dipping. 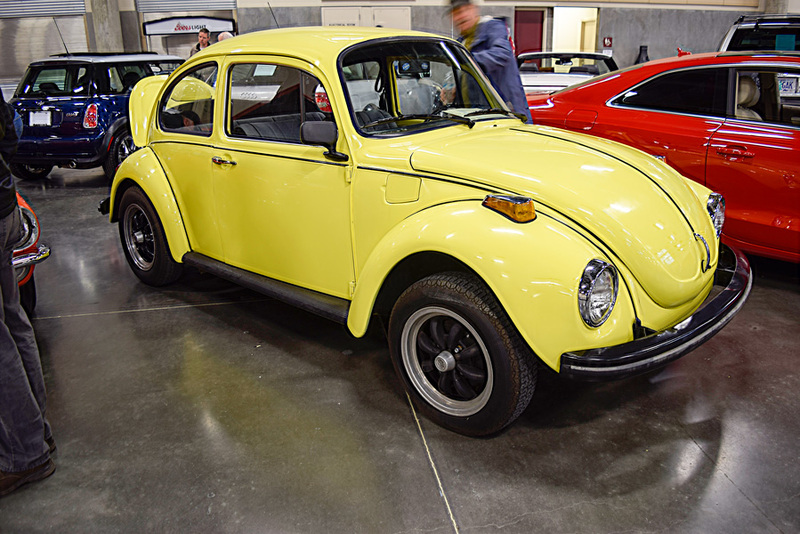 The necessary metal work was performed in addition to custom features such as 2.5” mini tubs, shaved gas door, and smoothed dash, just to name a few on an extensive list. The body was sat on a multi-link IRS Art Morrison chassis and all its sheet metal, glass, and drive train mocked up for proper fit and function before being sent to the body shop. Once in the shop the body was massaged to perfection, then, shot in coats of grey and black. Paint was followed by wet sanding and buffing until the body looked like marble. 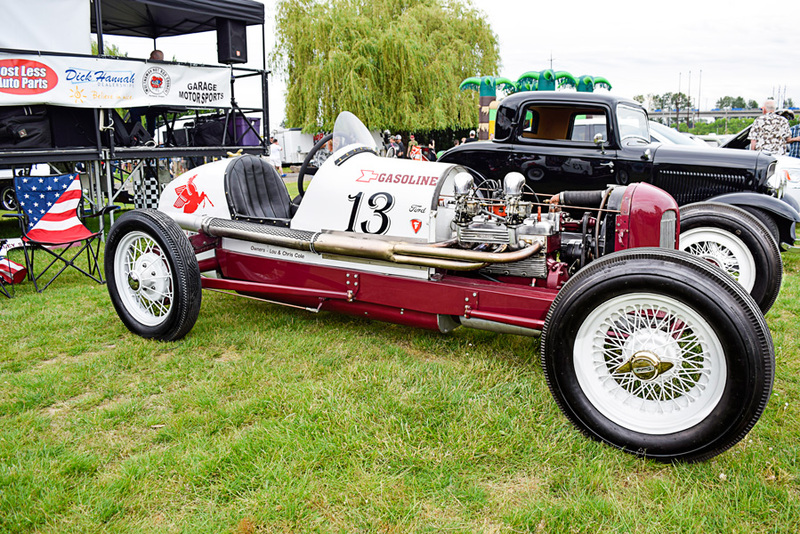 The chassis was painted and fully assembled as a roller with engine and transmission set into place. The body was mated to the chassis and the rest of the assembly was performed along with wiring and upholstery. The combo of the 55’s new GM Performance 430hp LS3 topped with MSD fuel injection and the Art Morrison chassis deliver an amazing level of comfort, performance, and reliability. 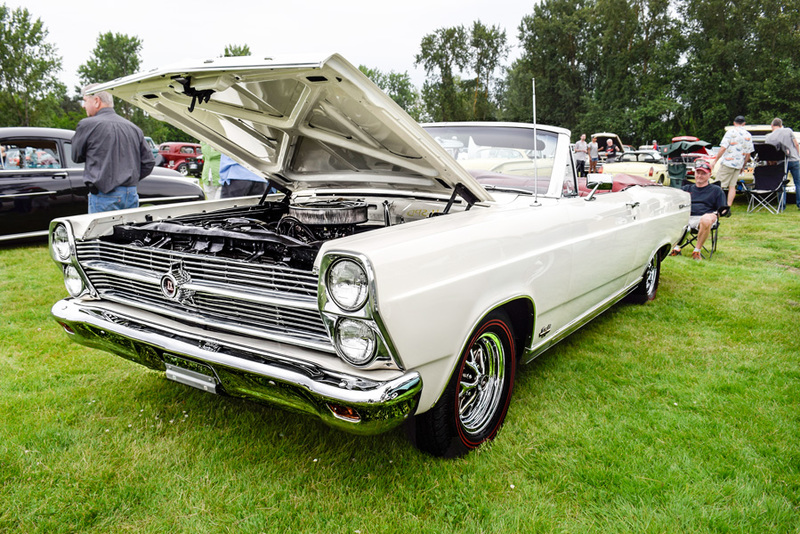 Pete can jump in the Chevy and enjoy years of cruising without the plaguing issues often associated with carbureted engines and today’s modern gasoline. The chassis delivers a level of comfort and smooth handling that will not leave Pete feeling fatigued even after long hours behind the wheel. 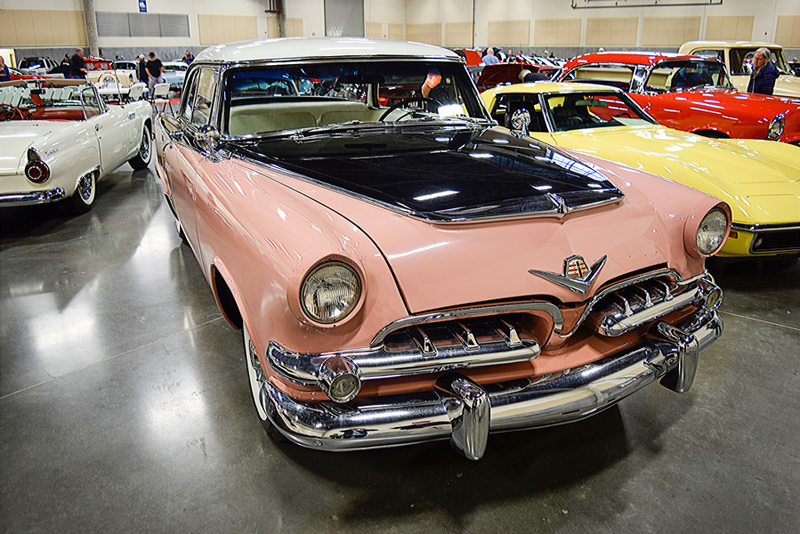 The 55 truly performs on both looks and performance—it is the definition of ProTouring in a classic car, and we hope Pete collects many memories in it feeling like the luckiest body in high school. First and foremost I would like to take a moment to mention Vic Edelbrock Jr., who passed away at press time. He caught a cold and he died at age 80. I had the pleasure of talking with him on a number of occasions as he represented his company. If there ever was a true GearHead, he was one. On a lighter note we are announcing the birthday of SEMA hall-of-famer Alex Xydias who has turned 95. 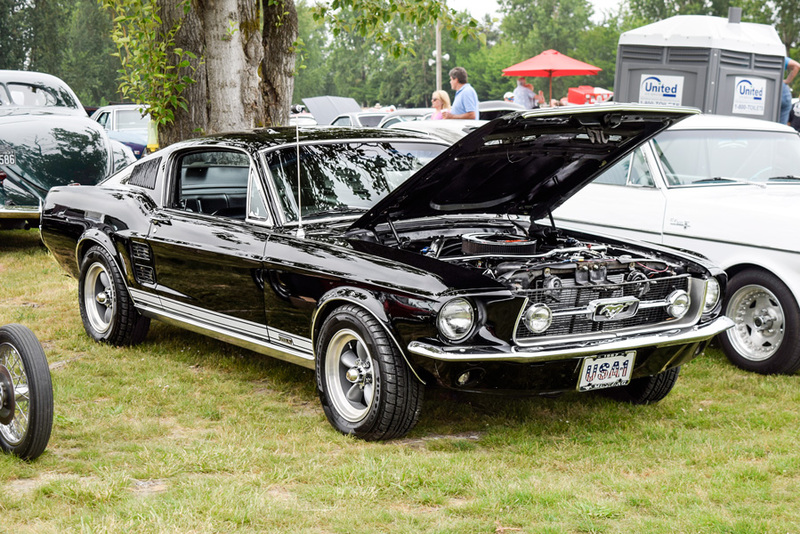 Now announcing National Collector Car Appreciation Day. This is our own personal holiday Gearheads. So, yes there are many members of Congress who think highly of us and our industry. They acknowledge that we have contributed much to America throughout the last century. So please take a moment to think about this on Friday July 14th. All GearHeads are encouraged to drive their cars on that day. There are many events going on to celebrate this holiday all across the nation and even in some foreign Nations. Check SEMAsan.com for a list of events. In other news the Recognizing The Protection of Motorsports (RPM) act continues to gain support in the House and Senate. We have over 125 Congressional sponsors. This is the act that is helping to beat back the EPA in there efforts for over enforcement of regulations that pertain to purpose-built race cars with vin tags and all of the industries that support them. If you have not yet signed on to this effort go to www.SEMA.org/RPM. SEMA is actively working in a number of states on a number of issues. Interestingly a recent bill has passed in Oregon which allows all military vehicles to obtain SP plates. This does not mean much to me because, as a certified signer for SP plates , I would pass all military vehicles. Now on to the state of Washington. They have opened their roads to use by autonomous vehicles. They see the economic value of getting involved with this. This is big, big money and a lot is happening. Now something interesting in California. The Senate has passed the surveillance transparency bill SB 21. This bill will require all police surveillance such as license plate readers, drones and such to be approved locally. They are leading the way in this effort. In addition California has been working on tightening up federal asset civil forfeiture laws. 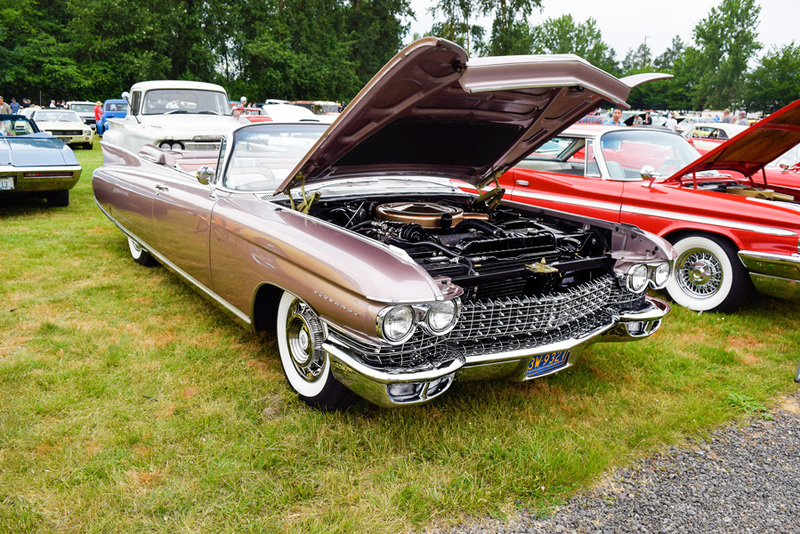 There are horror stories about people traveling to buy a collector car and being pulled over by cops who find the cash they are carrying and steal it from them under these Federal statutes. All they have to do is simply suspect that the cash might be ill-gotten and they can just take it! So what do you think of that Gearheads? Audi is coming to NY. intending to demonstrate and test vehicles in New York with Society of Automobile Engineers (SAE) Level 3 automation, according to the company. It will conduct the first autonomous vehicle demonstration in state history, beginning in Albany, near the state capitol, in mid-June. I have had plenty to say about EVs and AVs in this column. Now let’s talk about some predictions. “Rethinks” is a think tank who has been looking into a future of driverless autonomous vehicles and the impact they will have. They are saying that ride-sharing will grow big and will cause car sales to collapse. Ride-sharing will reduce the American vehicle Fleet to one fifth of today’s. Manufacturing of new cars will drop 70% by 2030. Price of oil will drop drastically by 2021. Dealerships, gas stations and car repair shops will completely disappear. Even now we have GM divesting their manufacturing in all of Europe and in numerous other countries. What do you think of all of this Gearheads? Now let’s talk about how the EVs and AVs are entering into the racing world. Universities, high schools and middle schools are getting more involved in this technology. Many of them are building kart tracks for the students. High schools have the ev Grand Prix. Jegs has built some EV Jr Dragsters. They are bad fast and they have to slow them down for the kids. Most of us know the ungodly torque EVs can make. New technology that is leading to super fast charging is really going to propel this industry, not only in racing but on the streets. A company called Dubuc Motors is set to release their Tomahawk luxury, carbon fiber, sports car in 2018. It can do 0 to 60 in 2 seconds with its 1,000 lbs/ft of torque and 4 electric motors. Daymak Inc. has announced its new product, the Daymak-C5-Blast Go-Kart, a machine the Daymak team believes will be the fastest electric go kart in the world. “We have developed the fastest, 100% clean energy go kart in the world by far,” says Aldo Baiocchi, President of Daymak, adding that company plans are to achieve 0 to 60 in less than 1.5 seconds. “It will be a little faster than the Tesla P100D,” says Baiocchi. According to Daymak, the C5 Blast Go-Kart features a liquid cool 10000w watt motor, Daymak Drive controller, 8 EDF motors. 4 in front and 4 in rear. Then we have the Chinese Start Up company, NIO who has come out with the electric Hybrid called EP9 that has set a new production lap at Nurburgring surpassing the Lamborghini Huracan. A lot of talk has been in the news lately of self-driving Taxi’s, with Über and other Taxi companies being interested in the technology. Now the Russian technology giant Yandex, has unveiled its self-driving Taxi prototype. The company has stated that eventually it would like to partner with car manufacturers who are looking to bring autonomous cars to the market. And don’t forget the Uber Flying Car, coming to skies near you soon. 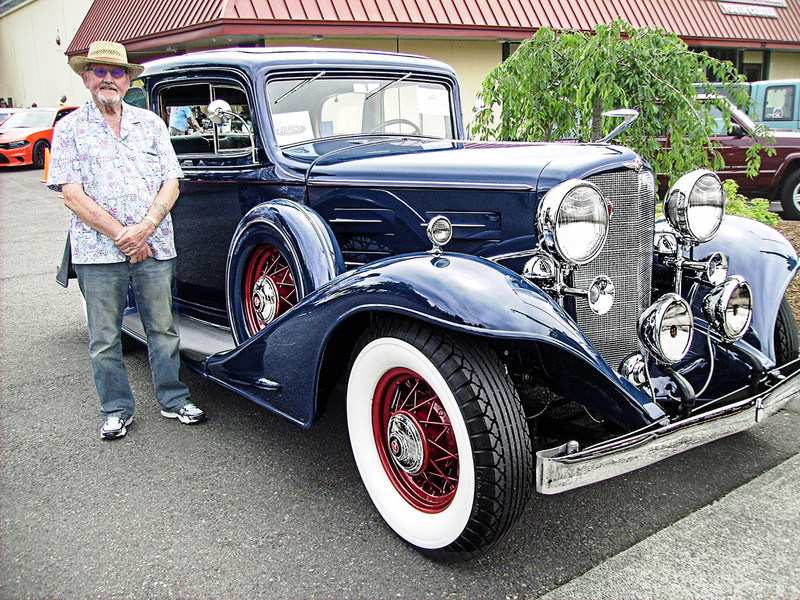 We would like to give kudos to an area shop, Steve’s Auto Restorations for donating a steel ’34 Custom Roadster body to the Ironmen Foundation providing scholarships to the children of fallen U.S. soldiers. And finally, Panther has just released their new line of 2017 water cars. I am remembering a vid I saw of one of these that looked like a Corvette and it was a monster on the water.